Volkswagen of Milwaukee North invites you to learn more about the versatile and contemporary 2019 Volkswagen Tiguan near Milwaukee, WI. Explore all the specs and options of this versatile and contemporary mid-size sporty SUV. For the brand-new model year, the updated 2019 Volkswagen Tiguan is here. After gaining massive appeal in the sedan and compact car genre, Volkswagen now switches its focus towards sport utility vehicles with the goal to modernize its mid-sized fleets. Tiguan joins the growing SUV class to become the latest bestseller. The 2nd generation 2019 Tiguan, which sports a chiseled, upgraded, and well-appointed appearance, definitely has what it takes to permanently leave the competition in the dust. For the 2019 model year, the Volkswagen Tiguan has received generous cosmetic and mechanical upgrades. Enhanced Seating: Tiguan now provides an optional third-row for added space for more passengers. Improved Style: The brand-new Tiguan currently has a modern-day exterior design inspired by the 2nd generation 2018 model year. Standard AWD: All the Tiguan trims now have 4MOTION® All-Wheel-Drive for much better, optimized traction and enhanced stability. All-New Drive Modes: The Tiguan now has a snow-mode for driving in extreme winter weather. Improved Engine: The 2019 Tiguan now has turbo-charged power with brand-new engine versions. Updated Multimedia: This year, Tiguan has the Fender® Premium Audio System. Advanced Safety Suite: With a fully loaded suite featuring blind spot detection and pedestrian monitoring system, Tiguan uses active driver assistance on-the-go. The Tiguan is now in its second-generation design and has a ton of new upgrades for 2019. The Tiguan rides on the car maker’s renowned MQB architecture and features a new contoured and sculpted body. Its style improvements also include strong LED headlights, front shutter grille, fog lights, and optional 20″ alloy wheels. This year, Tiguan has 10.6 inches of extra cabin room because of its longer wheelbase. The all-new cabin is filled with exceptional finishes, and materials while offering a host of contemporary upgrades for enhanced driver and passenger convenience. Want to learn even more about the 2019 Volkswagen Tiguan near Milwaukee, WI? 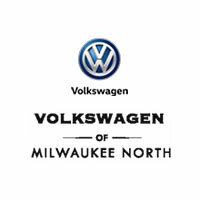 Visit Volkswagen of Milwaukee North online, in-person, or call us to schedule a test drive.